The AvantGrand N3X is unique in the world of digital pianos. Yamaha has drawn on over 150 years of piano-making expertise and combined it with industry leading technology to create the finest digital grand piano ever seen. 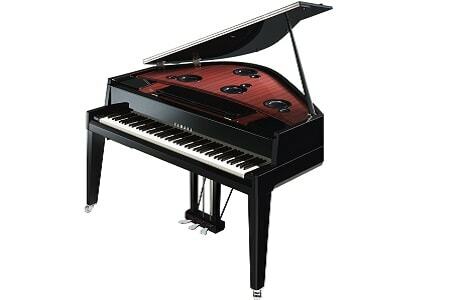 The N3X features the sound of CFX, Yamaha’s concert grand, and the Bösendorfer Imperial, the world’s largest and one of the most historic grand pianos. These renowned pianos are characterised by distinctive traits such as power, versatility, subtlety, lightness and mellowness. The sound of an acoustic piano resonates throughout its entire body. This is replicated by Yamaha’s Tactile Response System (TRS) which focuses on reproducing natural reverberation throughout the instrument. To express yourself musically, you need to form a physical bond with your instrument. The N3X has natural-feeling wooden keys and a full piano action inherited from Yamaha’s esteemed acoustic concert grand pianos. Beneath your fingers you can sense the same weight and responsiveness and the same scope for expression. To capture every nuance of the action’s movement, Yamaha uses two sensors for each key. One sensor gauges exactly how deeply and how long a key is pressed. The second sensor measures the timing and strength of the hammer movement. This information is instantly translated into a beautifully authentic sound reproduction. The more you play, the more you find yourself becoming one with the piano. The AvantGrand N3X features at the heart of Pianist magazine's video lessons with acclaimed concert pianist, Noriko Ogawa.